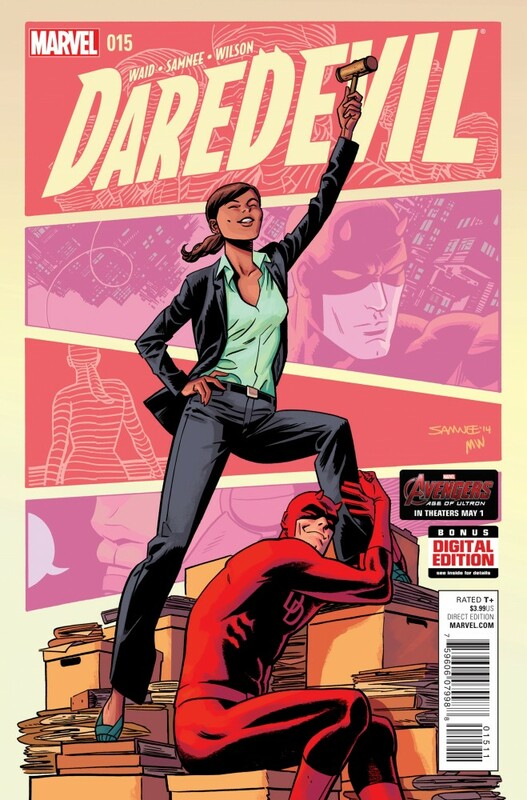 Many writers have taken on the task of making the life of Daredevil miserable, and while current Daredevil scribe Mark Waid has put Matt Murdock through some very difficult situations, things have been looking up for Matt lately. That’s until Daredevil #15. Things go south for Matt Murdock in a very public way that would seem to have consequences reaching far after this issue. The surprising degree to which Waid pushes Murdock’s situation makes Daredevil #15 a strong story. As I mentioned, Matt Murdock’s life had seem to be coming together since publically revealing that he was Daredevil and moving from New York City to San Francisco. Things are going well with girlfriend/law associate Kirsten McDuffie, Murdock is writing a biography that promises to be lucrative, and he feels a sense of comfort in his public person (which has been met with appreciation from the public), so much so that in the last issue of Daredevil, he leaves behind his old costume for one that doesn’t cover his face. However, things take a dramatic turn in Daredevil #15. The Shroud, who has been striding the line between good and evil, has kept Leland Owlsley (The Owl), with his new power of interfacing with all technology. So they have been keeping tabs on Matt Murdock. It might seem like Murdock has no more secrets with his identity now public knowledge. Yet what The Shroud reveals to everyone is very damaging to Murdock. He lets loose confidential videos with clients, revealing client secrets and testimony. Not only does this destroy Murdock’s law cases, it puts a lot of people at risk. The wildcard in this situation is Jubula Pride, the daughter of The Owl, who has teamed with Murdock to find her father. When they do encounter The Owl, The Shroud’s power is too strong and they have to flee. Jubula’s past is still mysterious, and Daredevil’s association with Jubula means that he appears to be scamming the mayor and the city. So Jubula and Daredevil are forced to flee, not only The Shroud but the entire city. Jubula suggests working with a powerful man – none other than Wilson Fisk, The Kingpin, who Murdock thought was dead. There is a lot to digest in this issue, and at times it does get confusing. Is The Shroud using The Owl or vice versa? Does the Purple Man have some tie to this? Jubula’s motivation and Matt teaming with her feels a little strange. Also, how does she know Fisk and what’s been happening with him? Even for someone who has been reading Daredevil since Waid’s first issue, it’s a little hard to keep track of all these threads, so I can imagine this might be especially hard for new readers. The art of Chris Samnee on Daredevil #15 is again a highlight. There are many panels where The Shroud is revealing something electronically, and the impact of those reveals could get lost without the art delivering a clear idea of what’s happening on the screen. However, Samnee makes the most of the little space of those screens, and there are so many of the screens that he’s clearly put a lot of time in the art on Daredevil #15. On the flip side, we’re now two issues into the red three-piece suit look of Daredevil, and I still do not like it. If anything, I dislike it even more than its debut in Daredevil #14. Waid and Samnee cannot bring back the classic red suit soon enough. The major change in Daredevil #15, putting all of Murdock’s client interviews online (and revealing that he’s been lying about Foggy Nelson’s death) means that Daredevil is no longer going to be San Francisco’s favorite son. It’s a step in possibly making Daredevil’s life again a hellish existence. The plot and pacing at times, though, makes this a loaded issue in terms of series arcs and continuity, so it’s not the most self-contained issue to read. Overall, though, Daredevil #15 might prove to eventually be one of the most important moments of Mark Waid’s time on the series.